My story begins in the strange and alien environment of a hospital burn-ward. After the plane crash, on 28 August 1988, I was sent to the hospital in Koblenz, admitted to an Intensive Care Unit, and placed into an artificially induced coma with artificial respiration—there my life hung on by a thin thread. It was not until sometime in October that the doctors felt more assured that I would not die. During this time, I went in and out of consciousness and when I was awake (although it was difficult to speak) I always tried to ask about Carmen and Nadine. The pain was unbelievable—I had lost 60% of my skin! Later I discovered that the doctors did not expect me to live, and so they told me that Carmen and Nadine were being treated in other hospitals. I guess they said this to remove my worry—but I knew it was very bad for them. In this dream-like state, I continued to live, at times with some semblance of clear thought and at other times confused and lost—time was passing me by. Many times each day I asked only for the truth about what had happened to Carmen and Nadine. My brain screamed out, “WHERE, is my family?” but I could not hear the words from my mouth because of the tube in my throat and the drugs put into my body. After October, the doctors where more certain that I would live—I was going to survive this tragedy! Now I had to come-to-grips with the fact, that I would have to endure a life-long struggle of both physical and psychological pain—the likes of which no person could ever understand or imagine. In the blink of an eye, on that day in August, my life had drastically changed. All that was familiar and comfortable was gone, and that which was to come would be new (but strange) and totally uncertain. I had never been a hospital patient before, now I was confined and confused and in a dream-like existence of pain killers. This dream became as familiar to me as any bad nightmare that anyone might experience, except for me, the nightmare never went away and the pain—was real. It was a type of pain that went back and forth - on and off - as consistent as the rising sun for each new day. It was only suppressed by the pain killers and more needles. It was medieval torture! I was in a large white room on the third-floor, there was a large window to see to the outside and every day (if my eyes were uncovered or when the drugs let me comprehend the view) I could see helicopters coming and going. I knew that was how I had come to be here. In the middle of this large room was only one bed—MY BED! It was the typical ICU hospital bed with wheels and cranks and knobs that anyone might expect to see, except that, the clean white bedding was replaced with a foam rubber mattress, covered sometimes with a blue sheet, and then sometimes with a green sheet. There were never any blankets to cover over me. There was a green sliding-door that separated me from everyone else (something like an air-lock). In front of that green door was a nurses station and it was here that they would write all their reports and watch me. The staff had everything they needed there to stay: a break room, sleeping room, kitchen, work station desk, and a sterile room for changing into special (green or blue) clothes so they could then enter my bed area. I felt like a lab rat in a science-fiction movie! There was another small window adjacent to the door that for some reason was covered most of the time with a black curtain, but I think it was for friends or relatives to see me. When a friend did come, no one could enter my bed area, instead they would talk to me by a telephone from the viewing window. Next to the large window (to the outside) was a special rolling medical cart with drawers. The cart was loaded with materials: bandages/gauze, rubber gloves, bottles with mysterious liquids, several cans of different salves, syringes, and a red plastic medical-waste container. I lay there in bed, with drain tubes put into various parts of my body and I was frequently stuck with the needles from the cart (tiny, pointed tormentors that were to be my ‘friends’ if I wanted to live). I had tubes in my stomach, tubes in my veins, tubes to drain the urine, and at the beginning a tube in my throat. I lost 30 kilograms of body weight. There were four different nurses who each worked a four-hour shift. Twenty-four hours a day, there was always a nurse in the room and they were always dressed in special clothes (for the protection against infection). I had two different doctors. The fire had made it difficult to get fluids into my body. It had damaged my veins enough that the needles were always being moved around from one vein to another, back-and-forth, again-and-again. It was madness! I lay, surrounded by monitors and machines that peeped and buzzed in the most irregular and strange manner. At first all these noises were foreign to me but as the days drifted on—they became all too familiar. I had begun the long routine to heal. Above me hung a countless amount of infusion bottles, which were frequently changed with new bottles and—through which the fluids were put into my body. Every place I was burned, my body was covered in a pasty salve-like gauze (see picture). Now Infection was my worst enemy, and if it came to me, it would kill me. The red plastic medical waste container was empty when I came into the room but it was full to the brim when I finally left that room. For reasons to do with the passing of infectious germs, I believe, that it was more correct to never empty this container (the fewer the items that came into my bed area and the fewer the times the air-lock door was opened, the better were my chances that a deadly infection would not come to kill me). The waste items that were first thrown into the container made a “clunking” noise when they hit the bottom, but as time wore on the sounds got shorter and softer until it was only a very soft “click”—the container was then full. This was a familiar event to me, and a sound that only I probably took noticed of or even heard at all. To think that my little 5-year old daughter, Nadine would be able to go though this too, was totally and completely absurd. In my mind I knew that my family was gone. In fact, it was not until the next Friday (five days after the accident) that anyone was really sure—who I was! When I was first admitted, the doctors thought I was an American mainly because someone at the crash-site placed a pair of American military boots on the stretcher with me. My father was frantic—he went to the Red Cross, and the police, and searched all over the various hospitals. When he was told that some people were sent to Koblenz, he went there only to be told, “There are no Germans here from the crash, just an American”. Other authorities at Ramstein told him that, “I was burned-up and there was no body left to see or bury” and still another told him that, “I might be on a big medivac C-141 airplane that went to America with many wounded people”. Finally a dental x-ray was taken and then they knew who I was. When my father was told that I was alive and in Koblenz, he was very much released from stress, but when he saw me he was still not sure it was me. My father came to see me every day (130 miles one way) and then sometimes the doctors would call him and say that, “Roland is near death” and so my father would drive the distance at night (or whenever the doctors called him) to come and see me—for the last time. On an unknown October evening a doctor and a counselor came to see me (I knew what they were going to say), and it was then that I was told that Carmen and Nadine were dead. They told me this in a good manner—directly and quickly. Now, at least, there would be no more doubt and false hopes—I had the truth! Still however, my head went swimming around in circles, even though I knew I was lying still, on my bed. My brain went twisting and turning through time that I had no recollection of, only to always stop at those awful memories of that beautiful Sunday afternoon. The same memories: again and again and again…someone, PLEASE wake me up! My brain was making the terrible pictures all by itself, when it wanted to—I was not in control of my brain! Again and again, the same nightmarish dream…. Sunday, August 28th was not a dream. It began for us: my five-year old daughter, Nadine; my wife, Carmen; and I, like so many other Sundays—we left home early to find a place where something interesting would be happening. On that Sunday it was the Flugtag (flying day) at the big American (Ramstein) Air Base. A festival atmosphere of American ice cream, hamburgers, French fries, and the main attraction of the airplanes (to walk around them and then to watch them fly). All the people, all the smells of food, all the strange interesting sounds, all on a clear and beautiful day—we were all having a fun time. At the Noon hour, the flying demonstrations began. For most of the spectators and for us as well it was very impressive. At the time it was still a real event to see these big metal machines up close. For me as an average guy I was not too knowledgeable about airplanes—my trade was as a cabinet maker (a carpenter). Shortly before the last flight demonstration of the day, we decided to start out for our car to avoid the traffic jam that would certainly follow. It was this time that the Italian Air Squadron was announced, so we went left to get to the access road that goes towards the Air Traffic Control Tower, and from there we could reach the parking space where our car was parked. While walking we watched the Italians fly from time to time but because of the mass of spectators we were pushed forwards and backwards several times. So to keep us all together we put Nadine between us, and we all held hands. I was just looking back when the Italian pilots were doing their “crossed heart” maneuver. “Look!” I said to Carmen. Suddenly there was an incredible BANG! I saw fire and parts of wreckage. Carmen didn’t even have time to turn around completely. But I only realized the danger when a part of the jet came directly at us. I thought this was not part of the air show. “RUN!” I shouted, but Carmen only looked at me with big eyes, as if she wanted to say that it was too late. Only a short “Oooh!” came from her lips, as a huge piece of wreckage hit her and bent her head in a sideways and unnatural way. That was the last I ever saw of her! In utter shock, I thought…This can’t be true!! In the same moment I was hit as well and thrown backwards about 15 - 25 feet.I fell, face first to the ground. During the fall I felt some kind of liquid spraying all over me. It was jet fuel and it was then instantly set on fire. Was this a nightmare? I was lying on the ground, burning!! When I tried to get up I realized that a big piece of metal was pressing down on my lower body. One leg was free, and by using it, I managed to get free from the piece of debris. The piece itself didn’t move because it was too large and heavy, but by pushing against it with my good leg, my pinned leg, slid away free. When I finally managed to get up, I looked around. 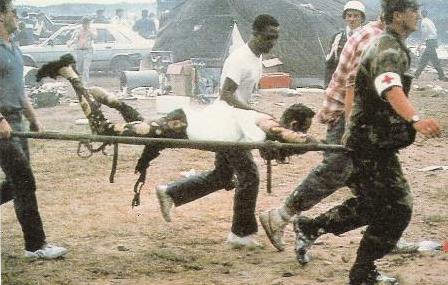 There were many dead and wounded people lying everywhere. Many were charred black, others were still burning. What I saw and heard was of unspeakable cruelty. While getting up I realized that something wet was hanging from my arms, my back and my face. I thought it was part of some clothes or a piece of cloth someone used to cover me and put out the flames. I tore at it to throw it down but it was my skin and it got longer the more I tore at it. I also had a cut on my leg from the piece of wing that lay on me and a deep cut in my head (that later needed stitches). Incredibly pain filled my brain. Immediately I tried to find out where we had been standing before the crash. I found Nadine right away. She lay face down on the ground. Her long blond hair was burnt. Her face, her hands, arms and legs completely charred. I heard her screaming. Her dress was still burning. It was incomprehensible!! I was rolling her on the ground, trying to erase the flames with my bare hands and shouting for help again and again and again. But everybody was just standing there, too shocked to react or still concerned for the fire and other explosions. Others were obviously deeply confused and just running around. Against those flames I had no chance with my bare hands. So it took me a lot of work to just reduce them some, especially since my hands kept catching on fire themselves. In the meantime I often looked for Carmen. But in between all those wounded it was impossible to spot her, since everything was black and I could not even recognize her clothes. Some just lay on the ground and looked at me, without moving or speaking. In those black, charred faces it was impossible to see any signs of life. The fact that Carmen might be one of them and that I could not recognize her almost put me out of my mind!! WHAT HAD HAPPENED!!? I tried to concentrate on Nadine. I picked her up and pressed her against my body, but her clothes were still on fire. She never stopped crying! Suddenly there came some Americans, I don’t know if they were soldiers or civilians. They held me firm while one of them took my daughter away and ran with her (I understand now to get medical attention for her, but at the time I did not know what was going on). I tried to get free with all my strength, but those who held me were stronger. The last vision I have of Nadine is of her arms, stretched out in my direction. I lost consciousness at that point. Even at the time it was occurring, I specifically remember three critical events (that I now know saved my life) to my going to the hospital at Koblenz. I was lying somewhere on the ground. When I opened my eyes and I saw many people milling around. Something wet and sticky was lying on and behind me. A woman passed by me. When our eyes met she stopped abruptly and began to shout (that was the first critical event – “our eyes met” - had that not occurred, I think I would be dead!). I think they believed I was dead and so I was put in a place with about ten other dead people. The wet and sticky something that I felt was the body of somebody who died because of his severe burns. The woman got somebody to help and then shortly four men were carrying me at my hands and feet. I remember that later I was lying outside on the ground, with my feet elevated. Somebody came with a bag full of ice cubes for cooling. Now there were many people around me to help me. They gave me lots of plastic cups with Coke and Fanta to drink; I was so very thirsty. I asked again and again about my wife and my daughter. The people tried to comfort me, they said “we will find them” or “they will be here soon”. At another point in time I was lying in a very big tent or some kind of hall on a stretcher. Many others were lying with me in this hall. Between these rows a man with a white coat and a list was walking around. Behind him came some other men, who were following his orders, and then carried one of the wounded away. They had already passed by me several times and now they stopped in front of me again. The man in the white coat looked at me for a very short moment, wrote something on his list, shook his head, and started to walk away. I started screaming immediately, although I had problems to make any sounds. They came back, something more was written on that list and at last I was carried away (this was the second critical event – “I started screaming” - (had I not done this, I think I would be dead). I was then flown by a helicopter to Landstuhl hospital, where I was lying for a very long time on a stretcher near the entrance to the building (I know this from a sketch I later drew which was then identified as being at Landstuhl). All around me there was chaos. An English speaking doctor and a nurse came by and asked me for my name in English. But I just couldn’t answer, only asking for my wife and daughter. It seems they didn’t understand me. I got an injection; after that I couldn’t move or speak any longer. But my eyes were open and I could still hear everything. The doctor cut away my shoes and the legs of my trousers or at least what was left of them. I was carried back out again. In front of the building was a big crowd. Next to my stretcher was a black man who carried my infusion bottle. I then must have flown by helicopter to Ramstien Base again but I can’t remember this but I then arrived to see a huge aircraft with the back part of it open (I believe now, that this was a C-141 Medivac). Next to it stood a helicopter, with its engines running—it was very noisy. We were almost inside of the aircraft when suddenly we had to turn back again and get out of the airplane (This is third critical event – “we had to turn back and went out of the airplane” - had this not happened, I think I would have died, because the flight to the States would have been too long for me with only in-flight med care). I don’t really know why; I suppose there was no more empty space left in the aircraft. There were many other wounded here, but compared to me they seemed to be quite well cared for, bandaged, and not as badly injured as I was. So it happened that I was loaded instead into the helicopter, which lifted off right away. 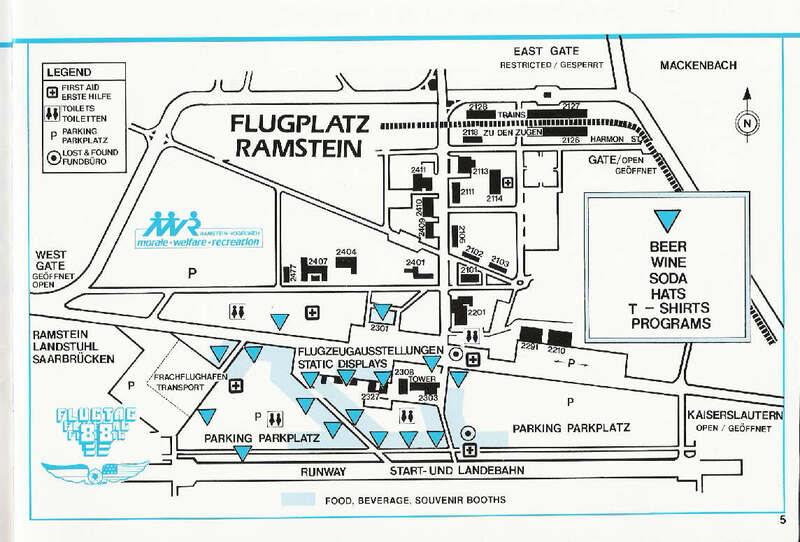 After landing, they opened up the doors, and I was surprised to see that we were still at the airfield in Ramstein (I remember this but yet it doesn’t make that much sense why this would occur like this). 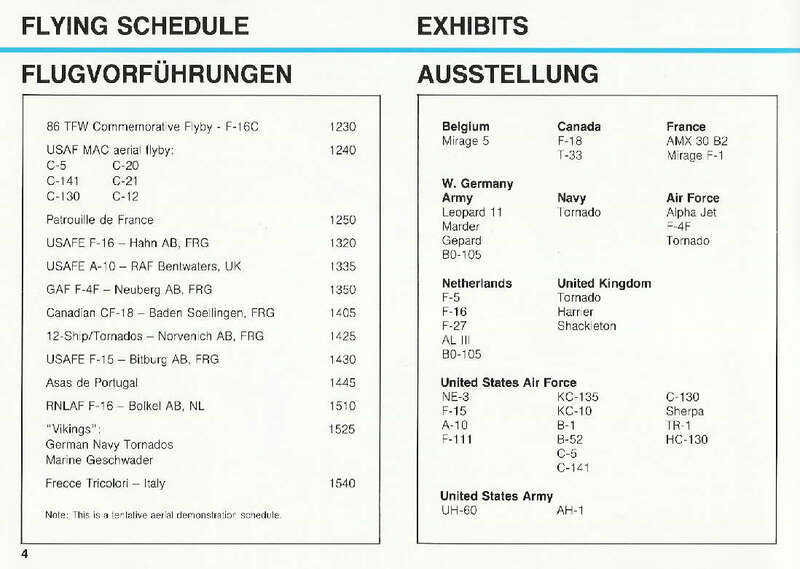 Not directly next to the place of the accident, but still quite near to it (maybe at the “Frachflughafen” on the plan/map?). That was evident because of the chaos that was still going on. I was disembarked and again lost consciousness. I came back for a short moment while I was lying inside another helicopter that just took off. This memory is still very clear, because the helicopter flew a curve while taking off and I was afraid of falling out. I was lying on the floor of the helicopter, and the door was open! Later, I learned that this was the helicopter that finally brought me to the hospital in Koblenz. Somebody who wasn’t there at this airfield probably can’t imagine the cruelty of the images, the burning people, their screams and their helpless looks. Only now I have got an inkling of how much a population must endure in any country when there is a war, a terrorist act, or some natural catastrophe. Carmen died immediately at the crash site (Aug 28th) and she was buried, 9 September. Nadine died, 9 September at 0940 hours at the Ludwigshafen hospital and she was buried, 13 September . 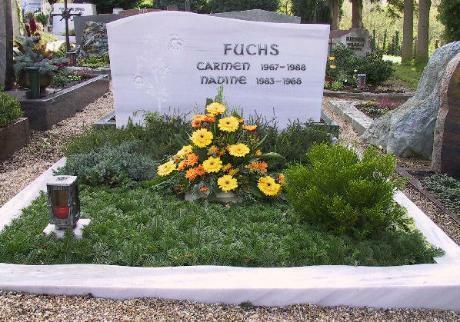 Carmen was buried on the same day that Nadine died. 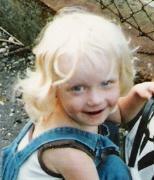 Nadine was 5 years old on 12 August.